Fresh Coriander Instead Of Parsley. 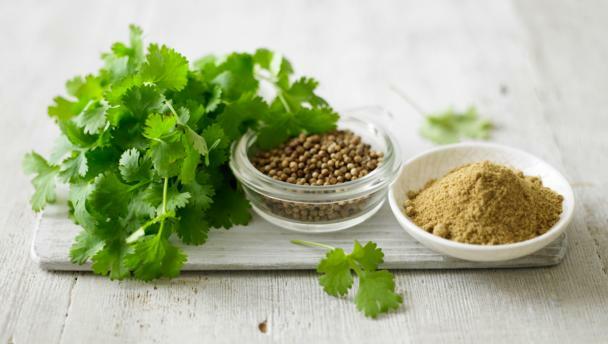 Fresh Coriander, Cilantro known in Hispanic circles, or Coriandolo in Italy, is used extensively in foods to give a special "note" to the overall taste. Fresh coriander is very much used in India, Pakistan, and other Eastern and Far Eastern countries for their wonderful dishes. It is also used in Mexico, Central and Latin America. Fresh Coriander On The Left, Dry Coriander Corns In The Middle, Finely Ground, Right. Dried Coriander is very much used in the Middle East for Falafel, Foul, Humus, mixed and fried with garlic for Molohia soup. In short it is one of the most used herbs/condiments in oriental cuisine. Fresh coriander looks like parsley and can be very easily mistaken for it, but the second you rub the fresh leaf between your fingers you can immediately smell the difference. Vitamins A, C and K.
Small quantities of Niacin, Vitamin B6, Phosphorous and Zinc. As a person who loves to cook, coriander can replace parsley in order to give what I call "zip" to the flavor of the final overall taste. As an example I would like to propose the well known Italian recipe of Spaghetti Aglio, Olio, Peperoncino e Coriandolo (Spaghetti with garlic, olive oil, hot chili and fresh coriander instead of the usual parsley). 500 gr spaghetti whatever thickness you like. 4 cloves of garlic very thinly chopped. ¼ cup of extra virgin olive oil. 1 or 2 chilies finely chopped to your degree of heat. ½ bunch fresh coriander finely chopped. Boil the water for the spaghetti. 100 ml water for every 100 gr of spaghetti. When water boils add salt (I don't). Add spaghetti and cook as per packet instructions to al dente. Meanwhile fry the garlic and chili separately in big deep pan. When spaghetti is ready, keep a cup of the boiling water, strain, and throw in hot oil/garlic/chili mixture. Mix well. Serve by sprinkling finely chopped fresh coriander and the freshly grated Parmesan on the side. Dig in and fully enjoy this wonderful easy dish.